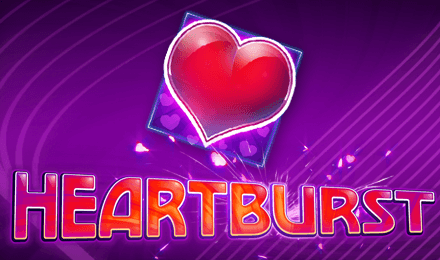 Let yourself be tempted with Heartburst Slot at Moon Games! It is an innovation of Eyecon made up of 5 reels and 100 paylines. A colourful backdrop and brightly coloured symbols are awaiting you. The design looks simple but attractive. On the reels, you can find symbols like Grapes, Watermelon, Orange, Cherry, Lemon, Bell, Lucky 7, A, K and Q. Load this well-designed game on a PC or mobile device at Moon Games! Start your game on Heartburst Slot by adjusting your stake. Toggle the Coins tab to select your desired amount. When you are ready, click on the Spin button to enjoy the game. You can also press the Auto Play tab to launch a set number of games played consecutively. At any moment, you can also stop this feature. Bet Levels: Betting levels are not present. Amount of Paylines Selection: Select up to 100 paylines for your gameplay. Coin Values: The coin denominations range from 0.01 to 0.50 units. With a 3x Multiplier linked with the Wild symbol on Heartburst Slot, the latter turns into an Expanding one and covers an entire reel, which is very rewarding. The Wild card on this game is the Heart which chips in for any other symbols to complete a winning combination, apart from Scatter. It appears only on reels 1, 3 and 5. The Scatter symbol is the Lucky 7, which helps to trigger the Heartburst Free Spins round. With at least 3 Lucky 7s on the reels, you can trigger the Heartburst Free Spins Feature. Three, four or five Lucky Sevens award 15, 20 or 25 free spins, respectively. You can retrigger this round up to 15 times in a row when more Scatters appear during the round. Heartburst Slot also comes with a Gamble Feature which allows you to gamble your last win. It is activated after any winning spin. Make the correct selection from the choices offered to double your win. Otherwise, everything is lost and the feature ends. You can make up to 5 correct selections and £32,000.00. Enjoy the retro classic style when you launch Heartburst Slot at Moon Games casino. Wish you all the best!